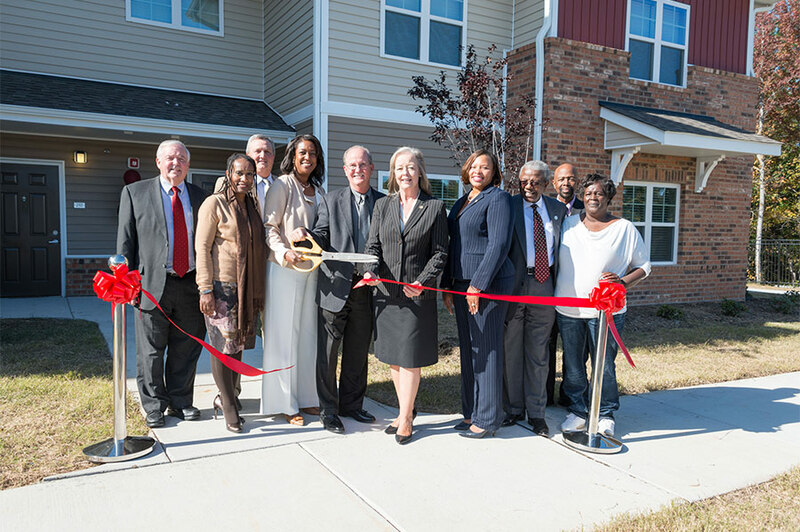 Salisbury, N.C. October 20, 2015 – Laurel Street Residential, master developer for the redevelopment of the former Civic Park Apartments, in collaboration with the Housing Authority of the City of Salisbury (SHA) and the City of Salisbury, proudly announce the grand opening of the newly renamed Brenner Crossing, a mixed-income apartment community, to be held on Thursday, Oct. 22, 2015, at 2 p.m. The celebration will feature several speakers, including Salisbury Mayor Pro-Tem Maggie Blackwell and Michael Williams, director of the Greensboro Office of Public Housing, who will welcome new residents to the mixed-income community. In 2012, The City of Salisbury and SHA were awarded a Choice Neighborhood Planning Grant from the U.S. Department of Housing and Urban Development to develop a Transformation Plan for the West End neighborhood. As part of that plan, SHA applied for and received an award from HUD’s Rental Assistance Demonstration (‘RAD’) program to redevelop the 80 units at Civic Park Apartments into a 170-unit mixed-income community, including replacing the 80 units at Civic Park. The new community, renamed Brenner Crossing, brings high-quality, affordable rental housing to a community where this is greatly needed, and it will be a logical complement to the significant, ongoing revitalization of the single-family portions of the West End neighborhood. Phase I of Brenner Crossing is comprised of 80 apartments designed for working families at 60 percent of the area’s median income or below. The units are one-, two- and three-bedroom apartments located within two- to three-story garden-style buildings on a 6.38-acre site. 36 of the 80 units are supported by a rental assistance contract from HUD, allowing Brenner Crossing to serve families at a broad range of incomes. Brenner Crossing lies within close proximity to grocery, shopping and employment centers such as the W.G. Hefner Veterans Affairs Medical Center and Livingstone College. Brenner Crossing was designed to blend into the existing character of the West End neighborhood. Architecture for Brenner Crossing was by Stogner Architecture; master site planning by Ramsay, Burgin, Smith Architects; and engineering and landscape architecture by Wagoner Consulting Engineers and MLA Design Group. Construction of Phase I was by Weaver Cooke Construction and R.J. Leeper Construction. Construction of Phase II will be by Miles-McClellan Construction. Several Salisbury-based sub-contractors were used for the construction of Brenner Crossing. Access to Fibrant, the City of Salisbury’s high speed Gigabit all fiber optic data networkPhase II will consist of townhomes and quadruplexes on a 9.95-acre site encompassing one-, two-, three- and four-bedroom apartments. Phase I was funded through a $700,000 allocation of federal tax credits by the North Carolina Housing Finance Agency (NCHFA). This tax credit allocation was sold to Red Stone Equity Partners to provide approximately $6 million of equity towards the development, which equates to about 60 percent of the project’s $10 million of total development costs. Remaining costs were funded by a construction loan from Fifth Third Bank, a permanent loan from The Community Development Trust, and subsidized loans from the NCHFA, the Housing Authority of the City of Salisbury, and The City of Salisbury. The same financial partners will participate in Phase II. Phase I and II combined represent a $24 million investment in the West End community. The developer and housing authority were mindful of the Civic Park families throughout the transformation. Since Phase I was constructed on vacant land acquired from Livingstone College, only a small number of residents needed to be temporarily relocated to other SHA public housing communities during Phase I. Phase II required additional temporary relocation of Civic Park families, who were given the highest priority to return to Brenner Crossing. Many families returned when Phase I was completed and more families will return at the completion of Phase II. Subsequently, these residents will be integrated with other working families at different income levels in the new mixed-income community.